"My husband loves to fish, so we have this quite often. This is a nice change of pace, and tasty tasty! Sweet and spicy." In a small bowl, blend mayonnaise and brown mustard. In a medium bowl, mix dry bread crumbs, shredded coconut, chopped mixed nuts, sugar, salt, and cayenne pepper. Dip fish in the mayonnaise mixture, then in the bread crumb mixture. Arrange coated fish fillets in the prepared baking dish. Bake 20 minutes in the preheated oven, until fish is easily flaked with a fork. 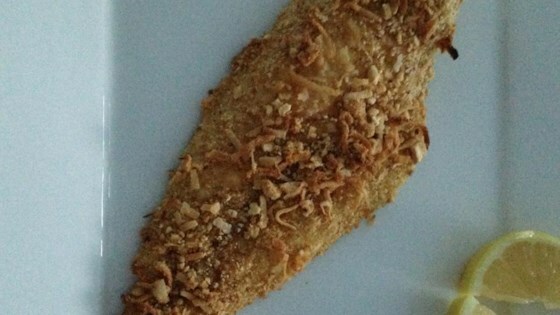 See how to make quick, mess-free pecan and coconut-crusted cod fillets. I mixed the dry spices with the wet ingredients instead of dry, and I used panko crumbs instead of bread crumbs. Simply delicious. Great recipe. To make it healthier I substituted Greek yogurt instead of the mayo.